Thank you so very much for your continued support! Success and progress can only be achieved with your help, one step at a time. Come see our current and future productions. Tell others about our theatre company and our mission, and about any of our productions you may have seen and enjoyed. Check out our Myspace page and join the group Fans of ReAct Theatre on Facebook. Come and participate in or support our upcoming fundraising events. Contact us if you are in the Seattle area and are interested in donating a little bit of time as a volunteer. We always have things to do! Donate your empty aluminum cans for recycling at any of our performances to help raise money for ReAct. Contact the arts editors at the major Seattle press and encourage not only continued and increased support for ReAct and coverage of our events, but increased coverage of theatre events in general. Be sure to contact your favorite television and radio stations as well. Send us your feedback and letters of support or contact local and national arts commissions to voice your appreciation of ReAct. Your letters of support will help increase our chances for funding opportunities. Send us a tax-deductible donation and inform us if you work for a company which makes matching contributions. Every cent you can donate will truly help! Use the websites www.goodshop.com and www.goodsearch.com for all your online shopping and searching needs and set ReAct as your beneficiary charity and free money will be raised for ReAct! 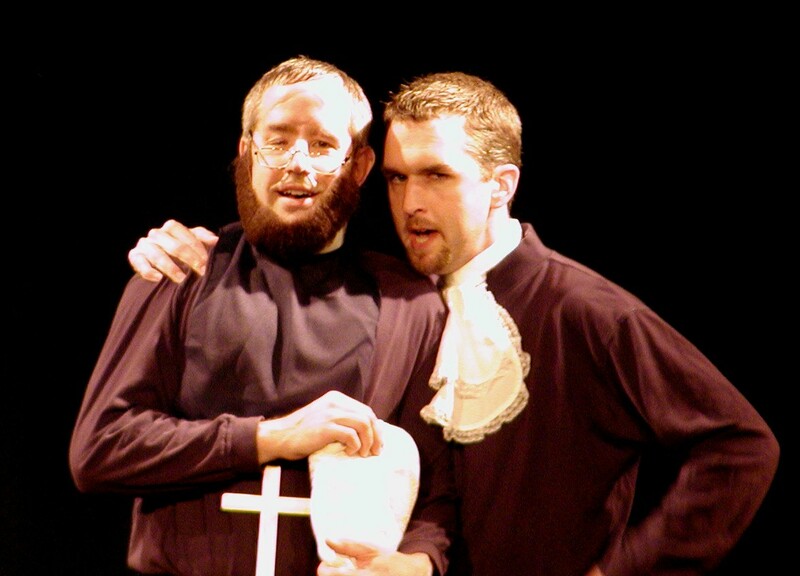 T.J. Langley as Tollhouse and Samuel Read as Brightbee in a scene from ReAct's The Book of Liz. September 2003. If you've seen our productions and feel that the local press should be giving us more consistent or increased coverage, please let your voice be heard. It would be a better world if the arts got as much coverage as sports, the weather, the movies or even television.